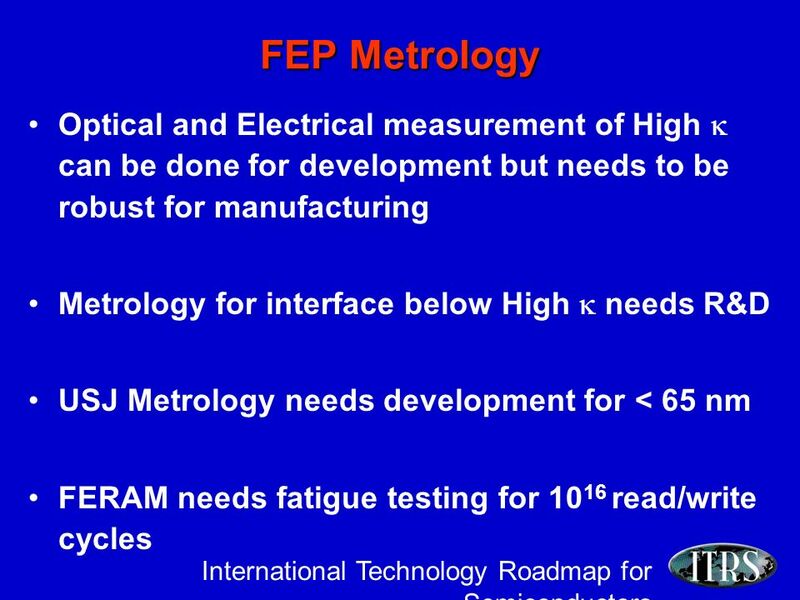 International Technology Roadmap for Semiconductors Metrology Roadmap 2001 Update EuropeAlain Deleporte (ST)4/01 Alec Reader (Philips Analytical) Vincent. 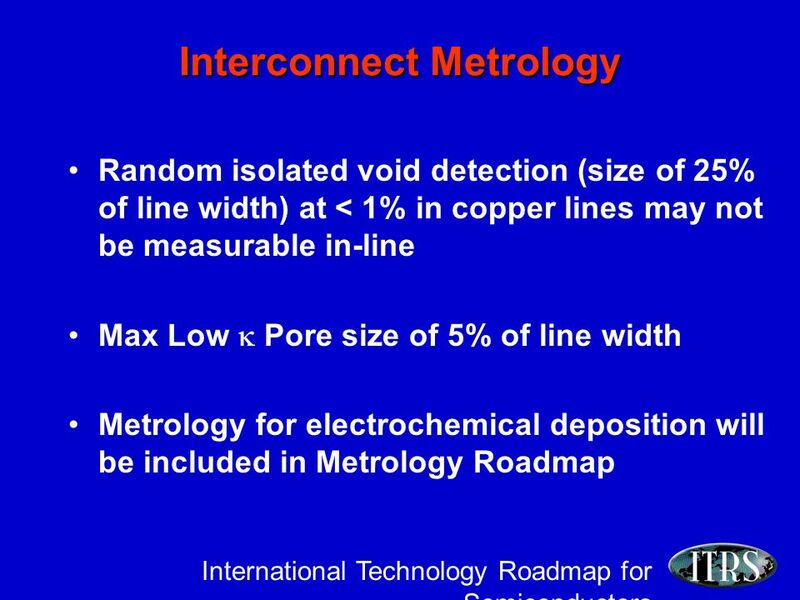 3 International Technology Roadmap for Semiconductors New to – Five Difficult Challenges 65nm / Before 2007 New to – Five Difficult Challenges 65nm / Before 2007 Key requirement for Cu/Damascene metrology is void detection in Cu lines and pore size distribution (find killer voids and pores) Scribe line shrinkage reduce test structure area making high precision measurements difficult in scribe lines. 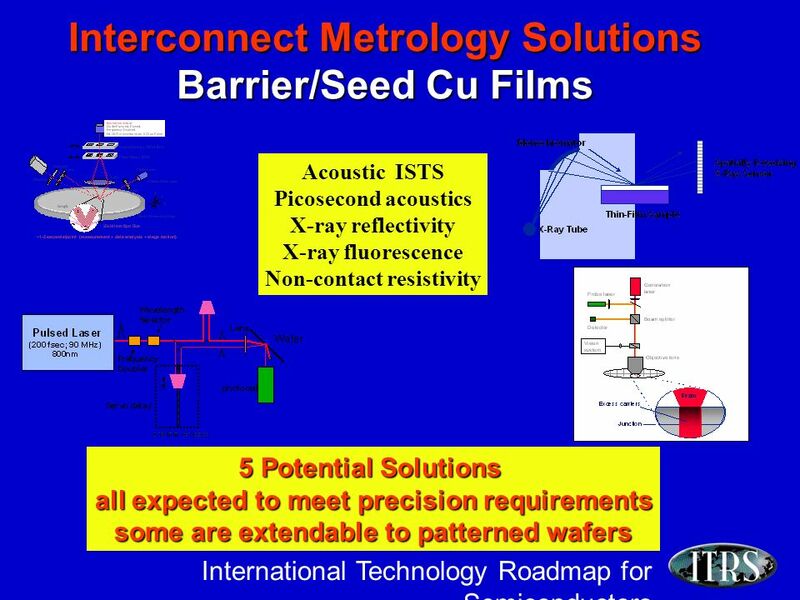 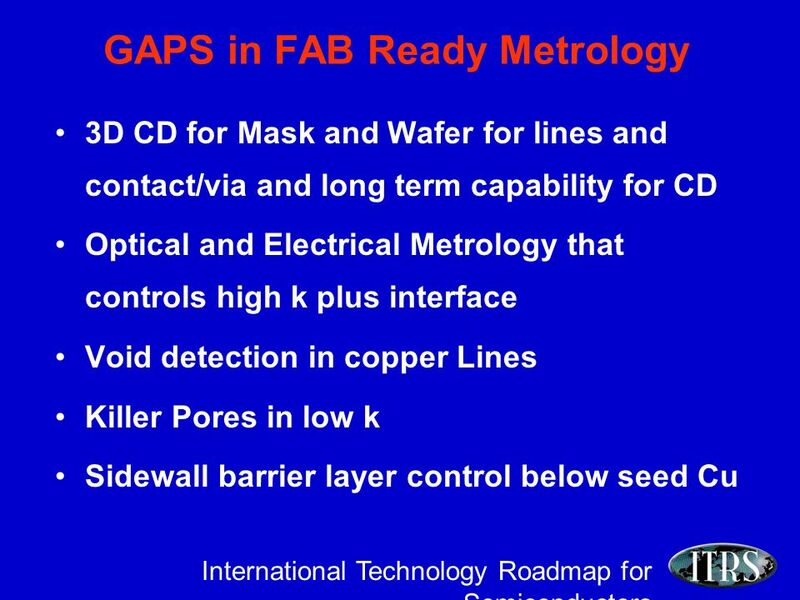 7 International Technology Roadmap for Semiconductors Difficult Challenges before 65 nm / 2007 Factory level and company-wide metrology integration Impurity detection (especially particles) at levels of interest for starting materials & reduced edge exclusion for metrology tools. 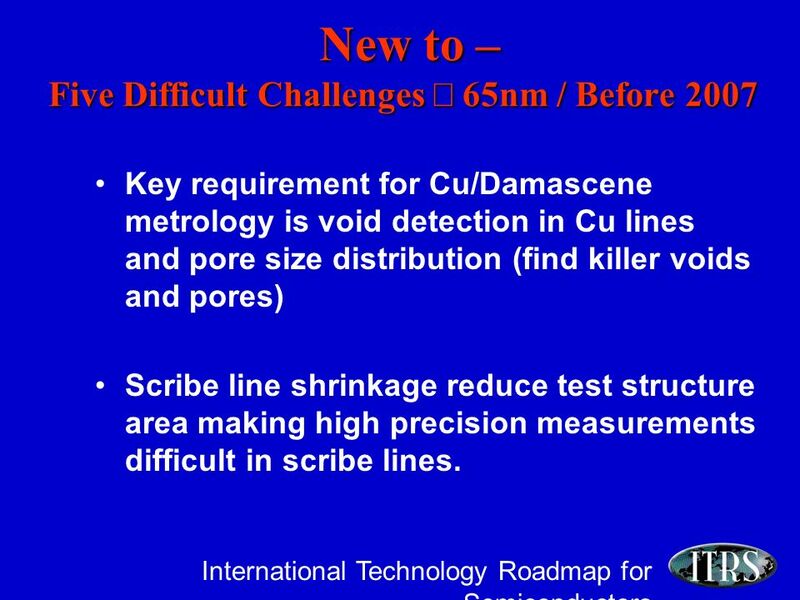 Control of high-aspect ratio technologies such as Damascene challenges all metrology methods. 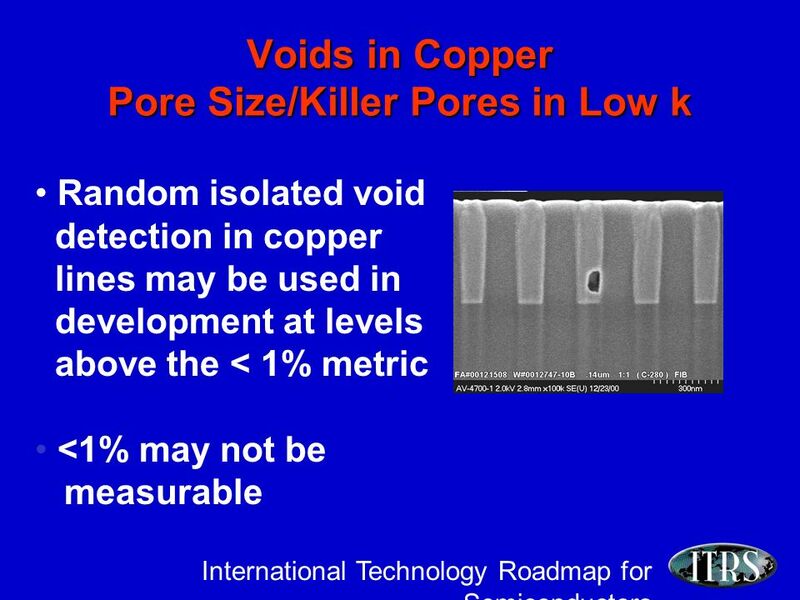 Key requirements are void detection in copper lines and pore size distribution in patterned low k. Measurement of complex material stacks and interfacial properties including physical and electrical properties. 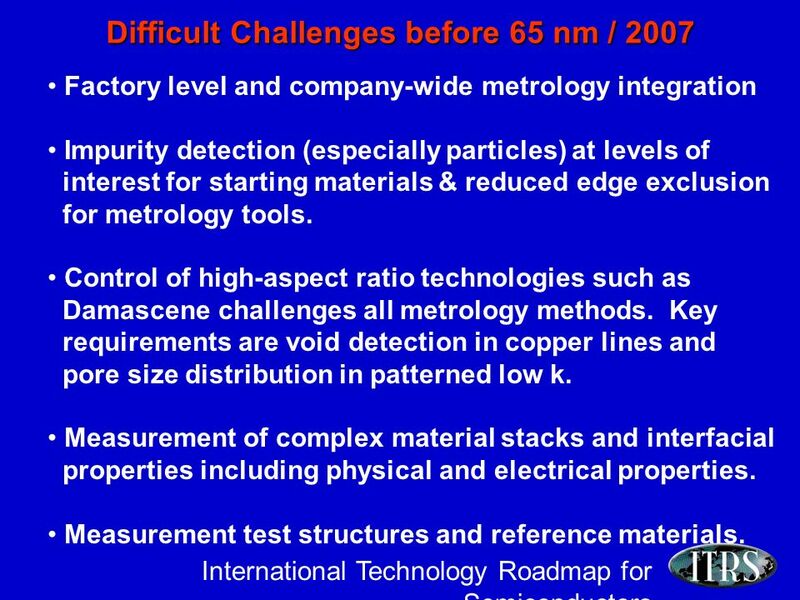 Measurement test structures and reference materials. 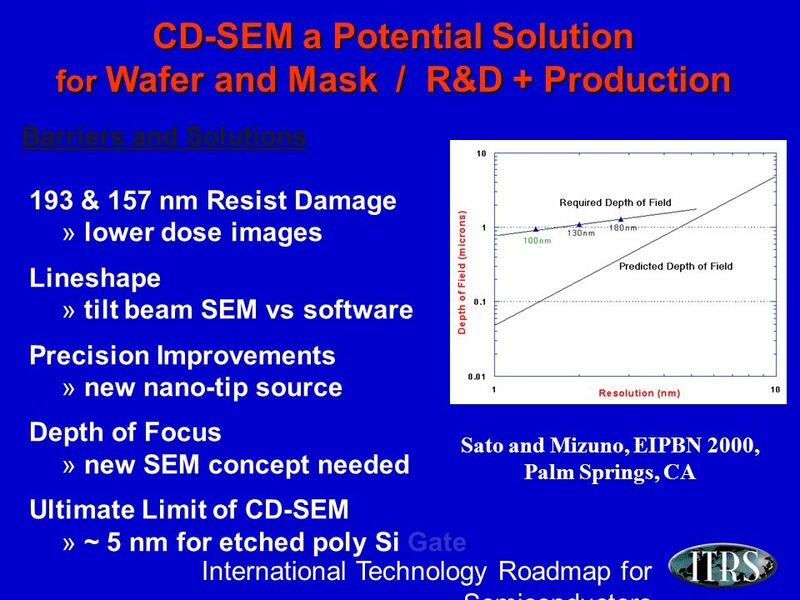 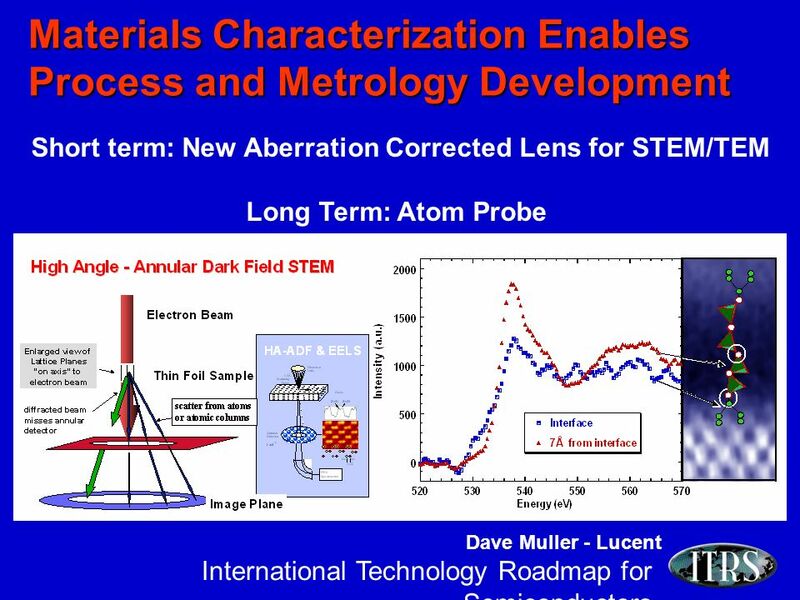 8 International Technology Roadmap for Semiconductors Difficult Challenges after 65 nm / 2007 Nondestructive, production worthy wafer and mask level microscopy for critical dimension measurement for 3-D structures, overlay, defect detection, and analysis. 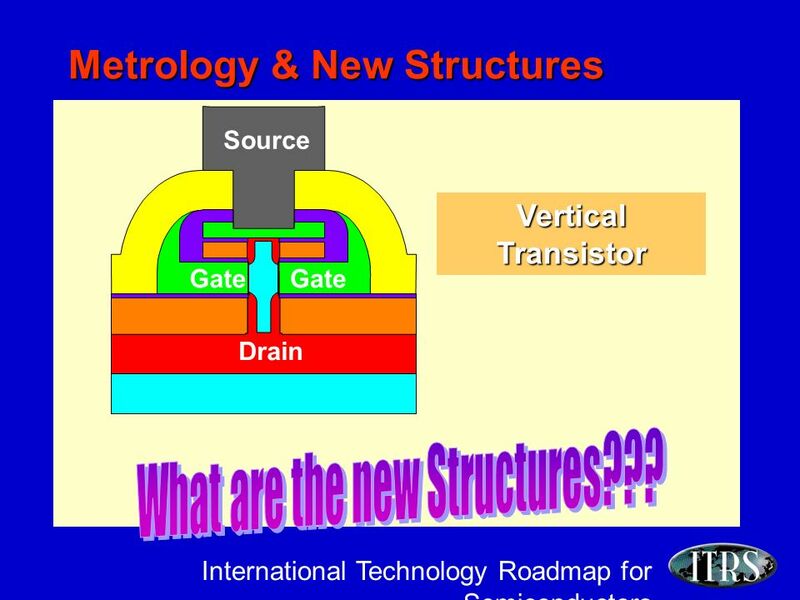 Standard electrical test methods for reliability of new materials, such as ultra-thin gate and capacitor dielectric materials, are not available. 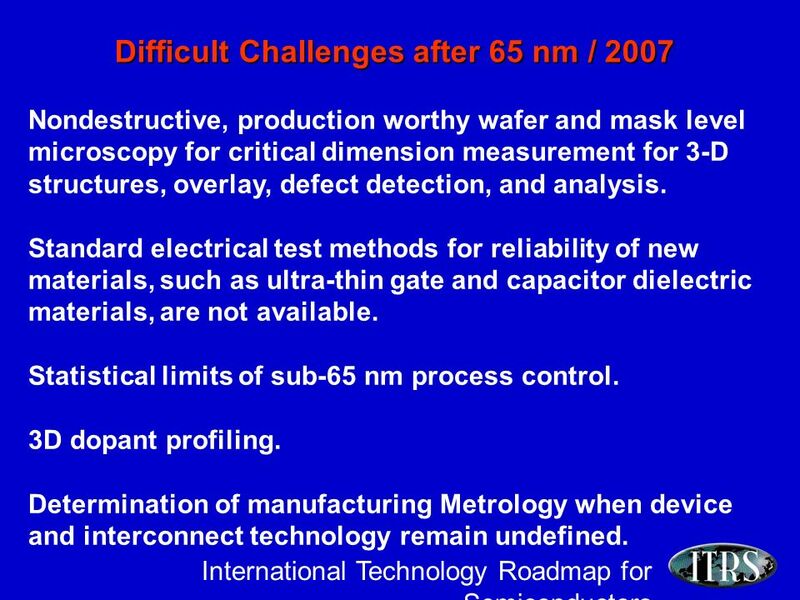 Statistical limits of sub-65 nm process control. 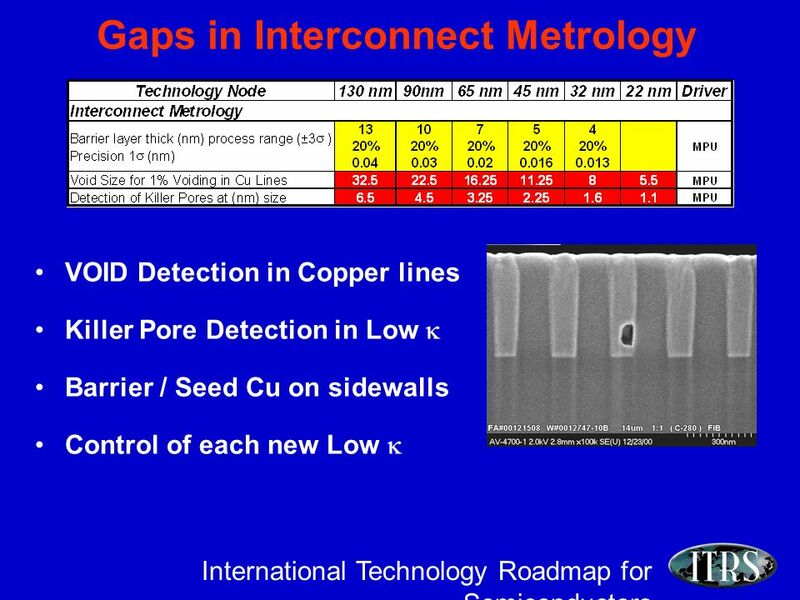 3D dopant profiling. 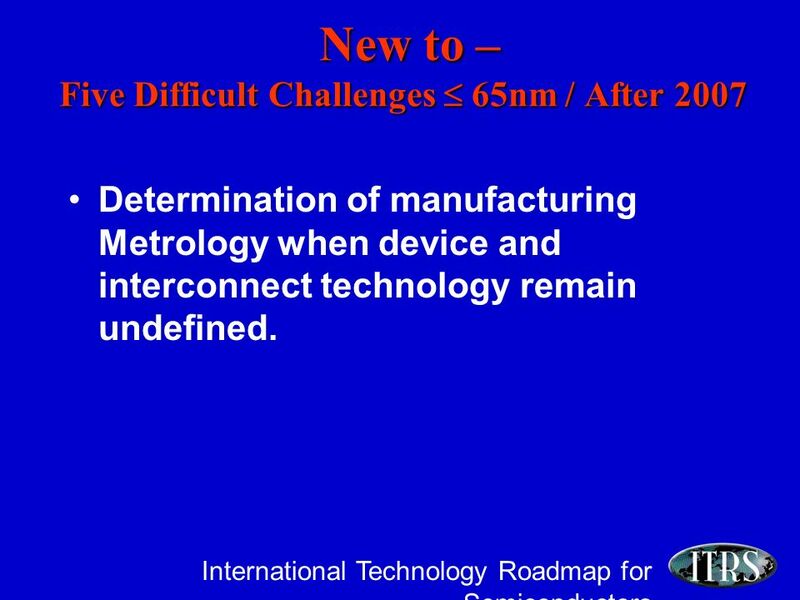 Determination of manufacturing Metrology when device and interconnect technology remain undefined. 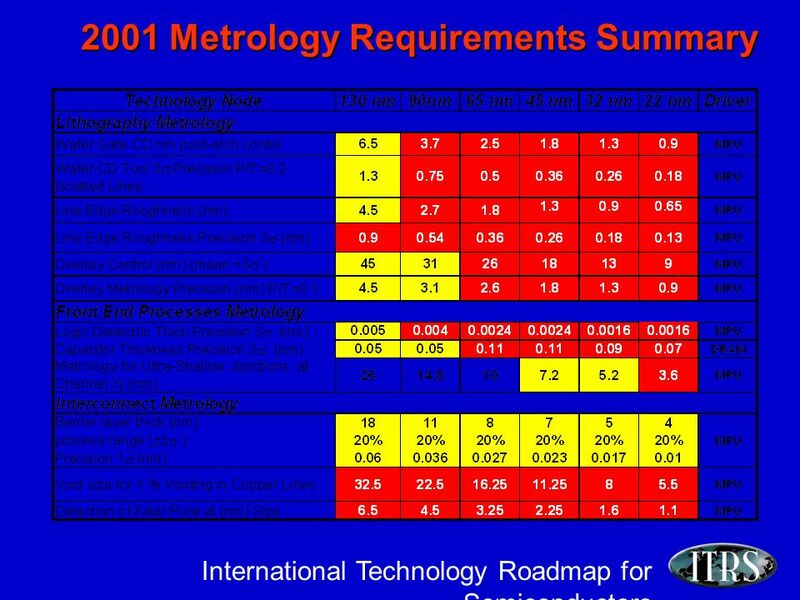 12 International Technology Roadmap for Semiconductors Why are CD Measurement Requirements RED? 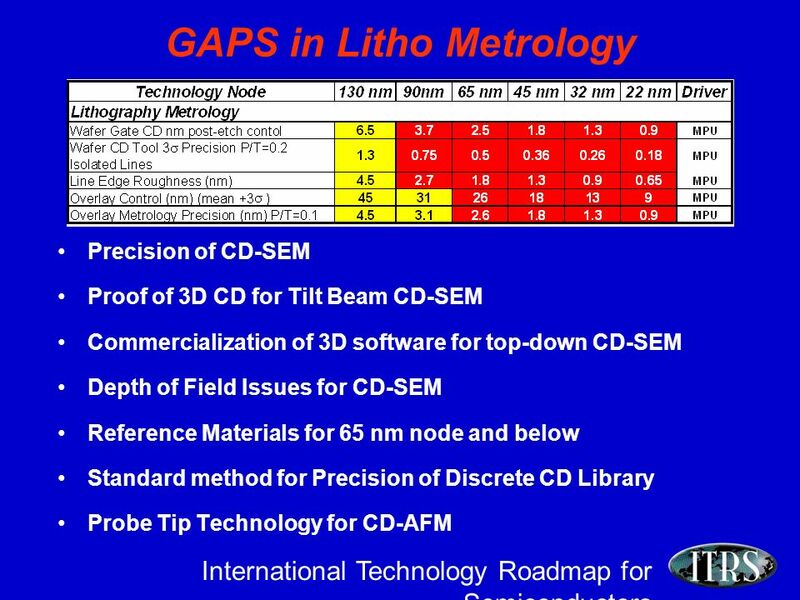 There is no universal metrology solution for all CD measurements. 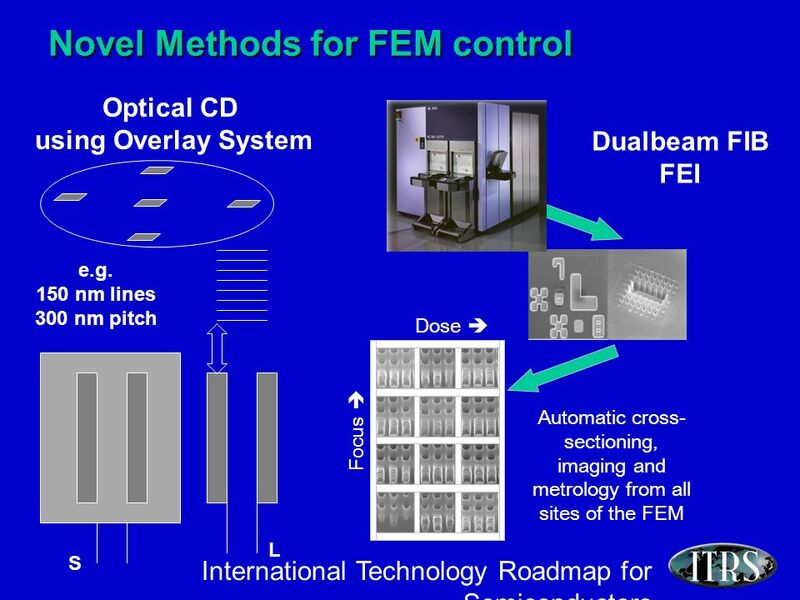 –e.g., Scatterometry meets Focus-Exposure precision needs to (70 nm node?) 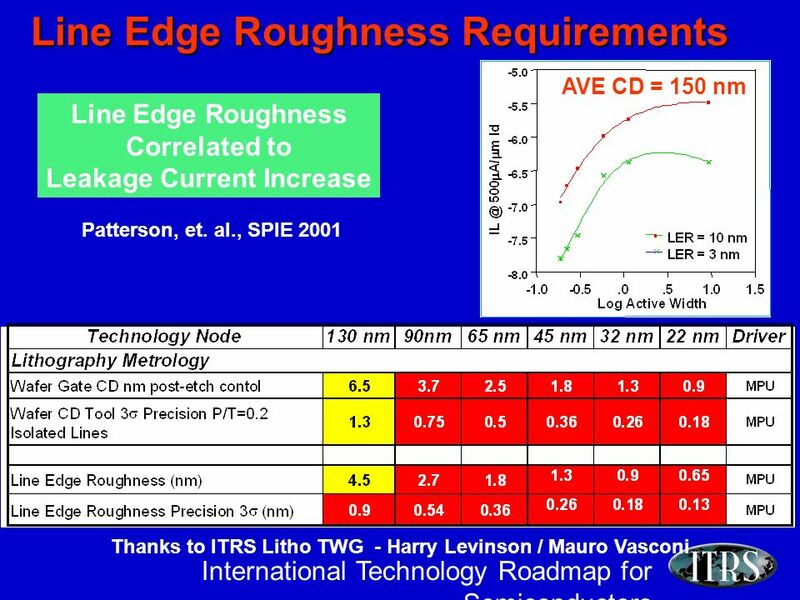 for resist lines but not for contacts (yet). 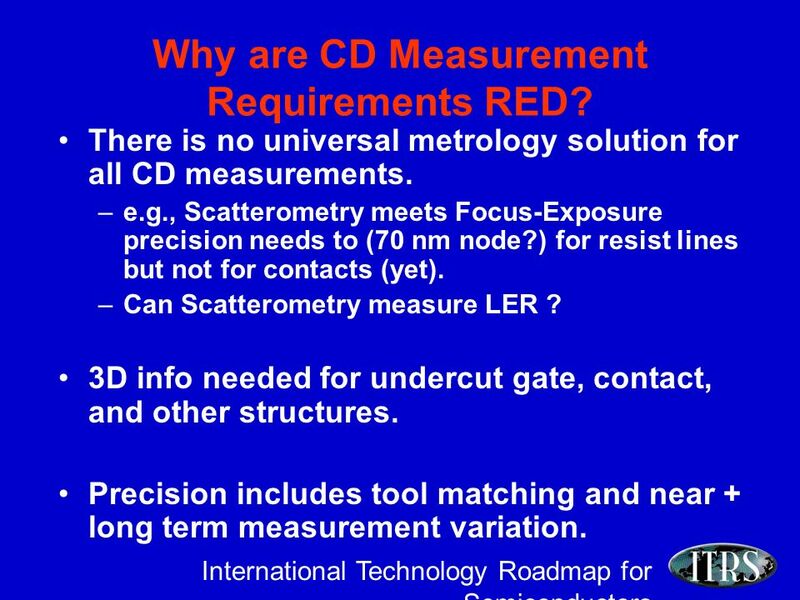 –Can Scatterometry measure LER ? 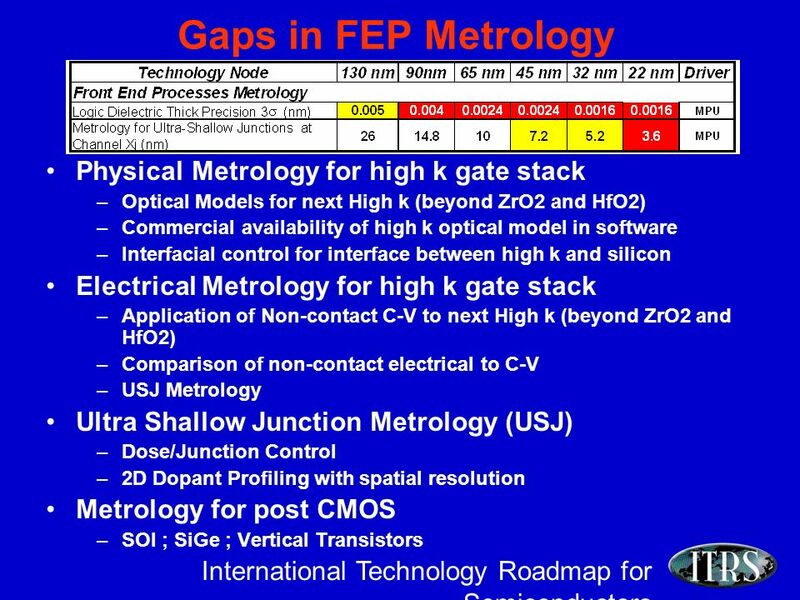 3D info needed for undercut gate, contact, and other structures. 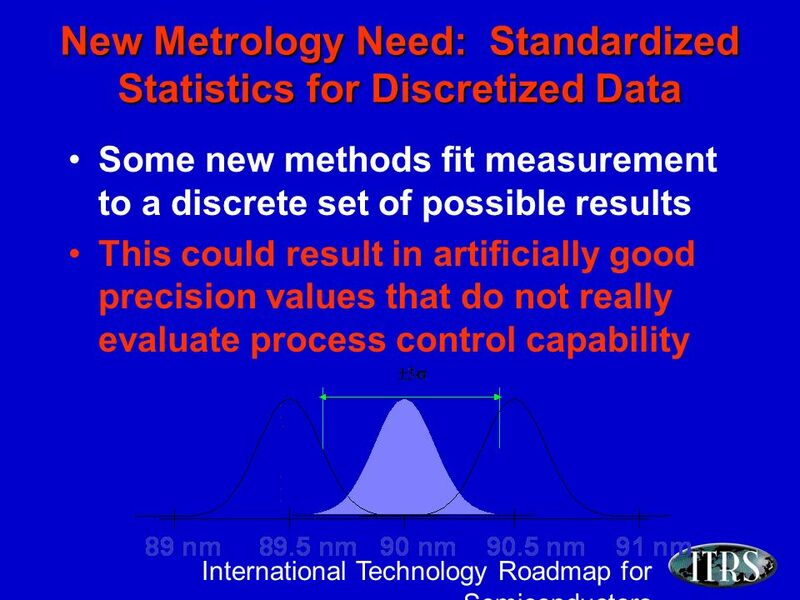 Precision includes tool matching and near + long term measurement variation. 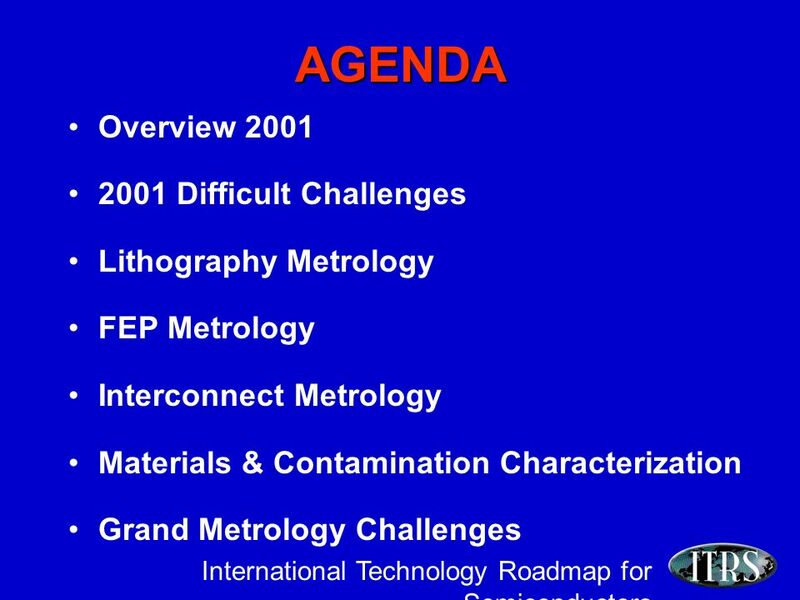 18 International Technology Roadmap for Semiconductors 2001 Grand Challenges Development of Metrology tools in time. 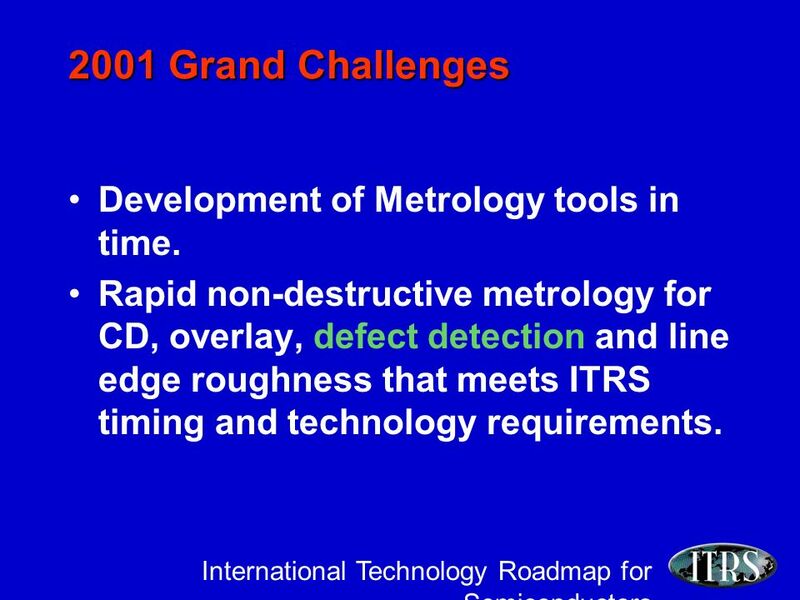 Rapid non-destructive metrology for CD, overlay, defect detection and line edge roughness that meets ITRS timing and technology requirements. 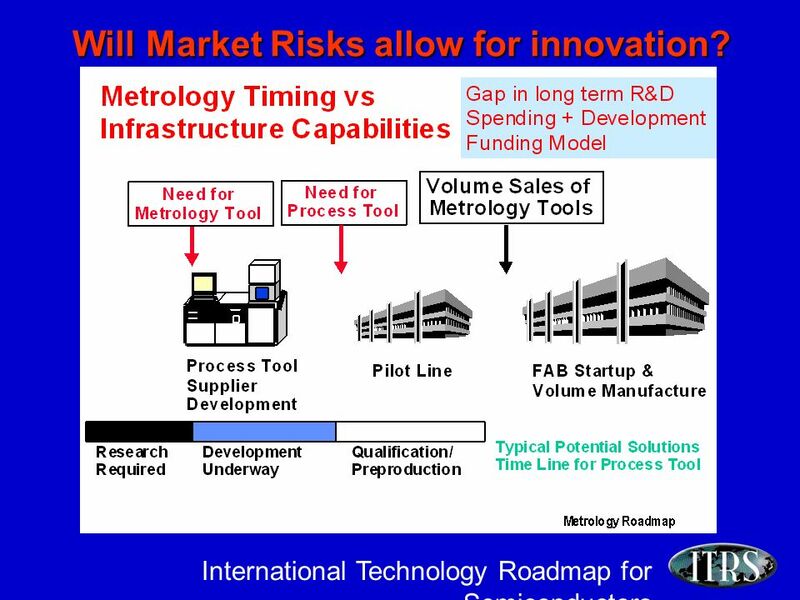 19 International Technology Roadmap for Semiconductors Will Market Risks allow for innovation? 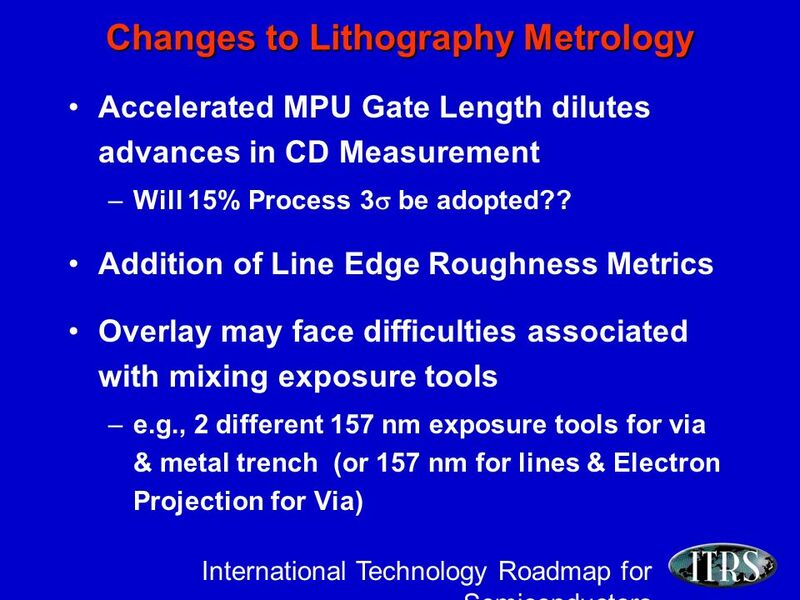 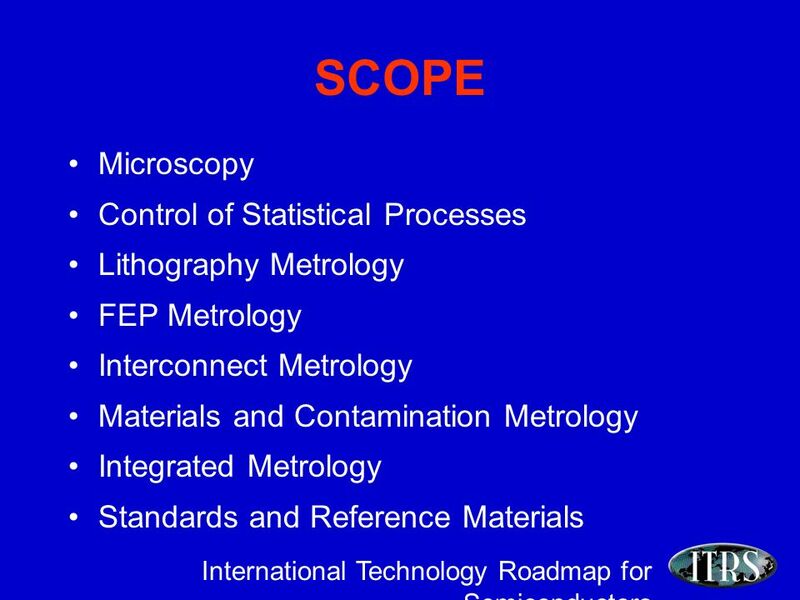 Download ppt "International Technology Roadmap for Semiconductors Metrology Roadmap 2001 Update EuropeAlain Deleporte (ST)4/01 Alec Reader (Philips Analytical) Vincent." 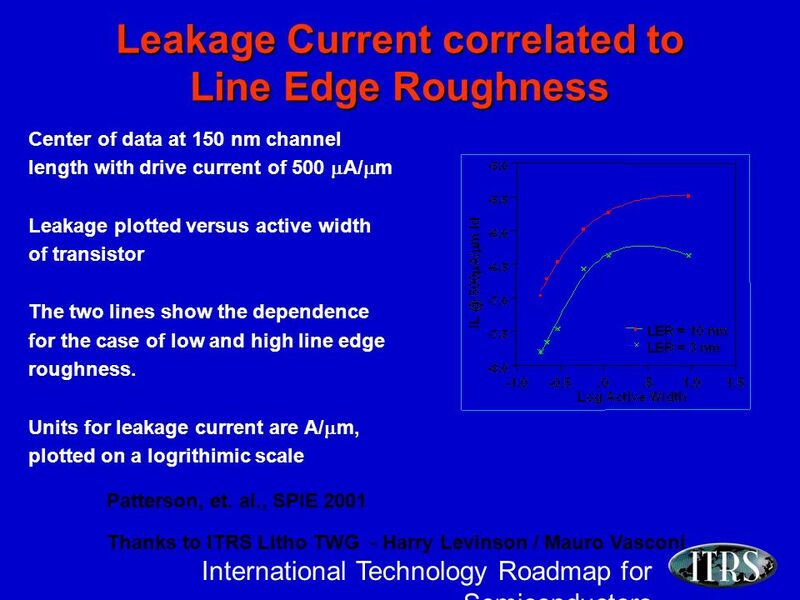 1 Feb19, 2003 ITRS 2003, Sunnyvale, Ca ITRS Conference April 3-4, 2003 Amsterdam, Netherlands ITRS 2003 Yield Enhancement TWG Attendees: Mike Retersdorf. 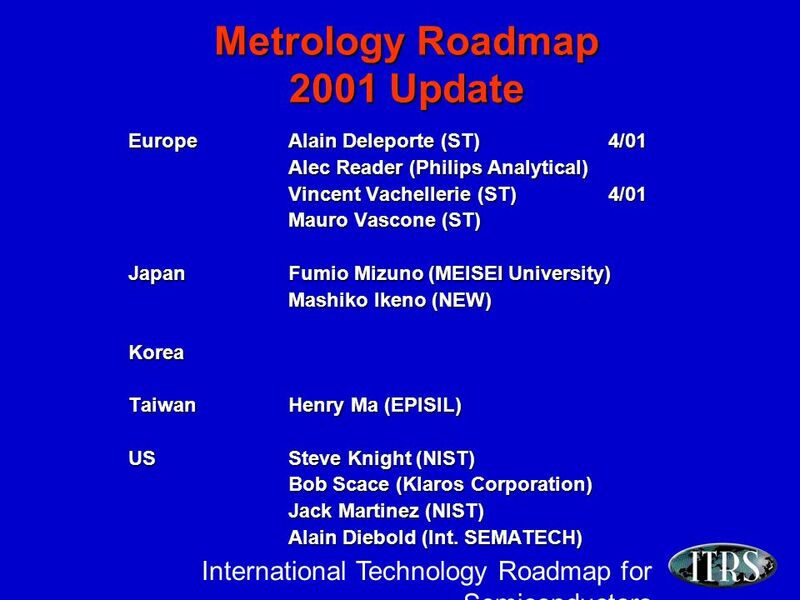 Metrology Roadmap 2003 Update EuropeUlrich Mantz (Infineon) Mauro Vasconi (ST) JapanMasahiko Ikeno (Mitsubishi) Toshihiko Osada (Fujitsu) Akira Okamoto. 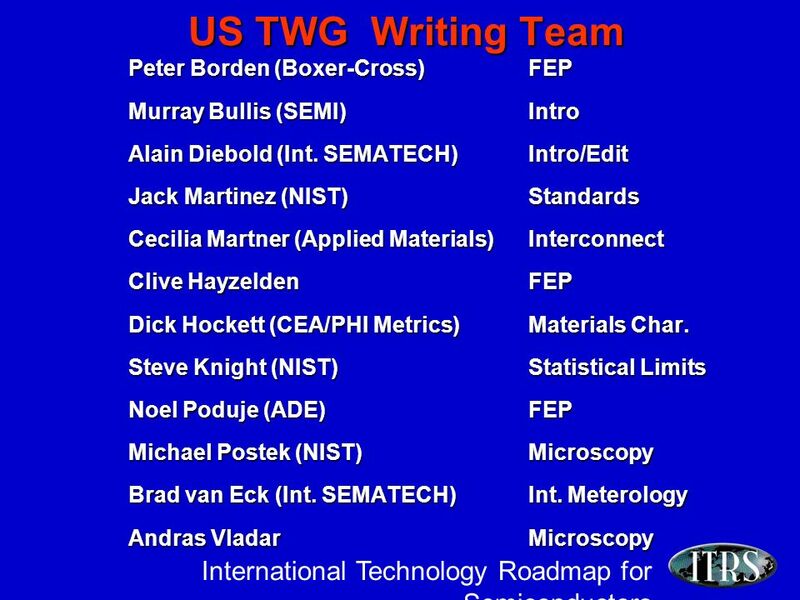 Work in Progress --- Not for Publication 18 July 2001 Work In Progress – Not for Publication Interconnect Working Group 2001 Draft 18 July 2001 San Francisco. 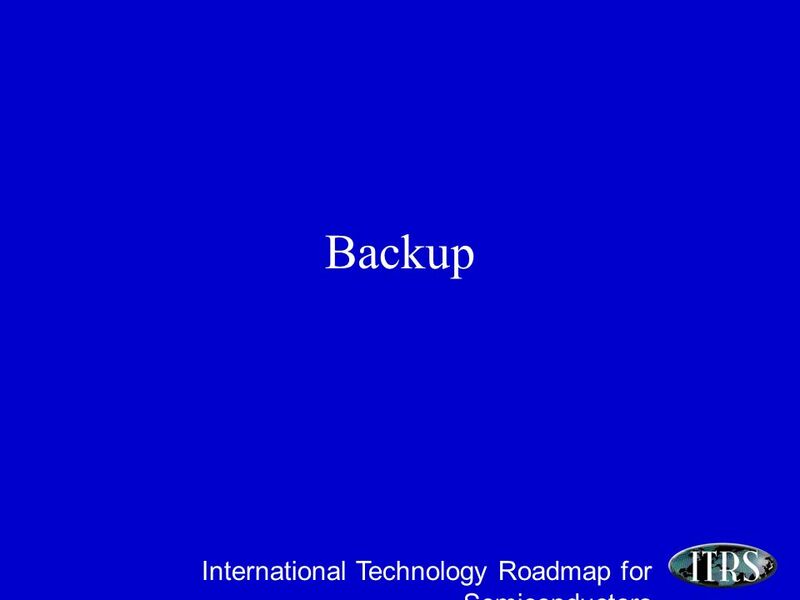 4 December 2002, ITRS 2002 Update Conference Interconnect Working Group ITRS December 2002 Tokyo.